Why should DevOps use a Binary Repository Manager? 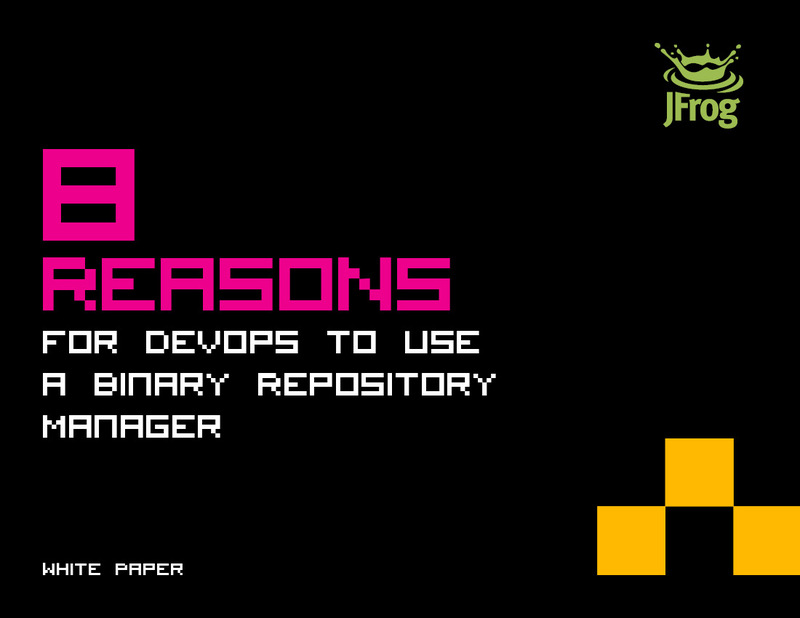 This white paper describes how a Binary Repository Manager such as Artifactory gives a DevOps team the tools to efficiently manage an ever-growing matrix of binaries, environments and geographically distributed sites to ensure a smooth application development workflow. Systems that are considered mission-critical to an organization can be deployed in a High Availability configuration to increase stability and reliability. This is done by replicating nodes in the system and deploying them as a redundant cluster to remove the complete reliability on any single node. In a High Availability configuration there is no single-point-of-failure. If any specific node goes down, the system continues to operate seamlessly and transparently to its users through the remaining, redundant nodes with no down time or degradation of performance of the system as a whole. Playing such a central role in development of your products, the servers hosting your binaries (whether you downloaded them or developed them) can become mission-critical components of your organization. As DevOps, it’s your responsibility to keep those systems running, and any downtime can have severe consequences for your development workflow. 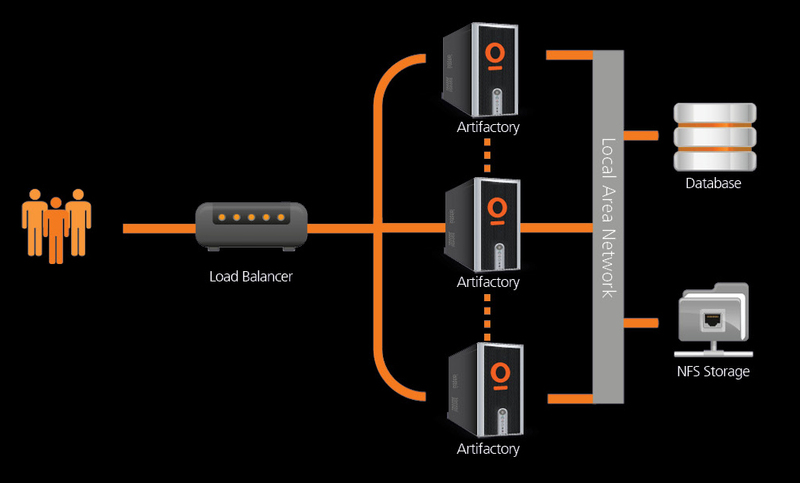 Artifactory supports a High Availability configuration with a cluster of 2 or more active/ active Artifactory servers on the same Local Area Network. Your system can continue to operate as long as at least one of the Artifactory nodes is operational. This maximizes your uptime and can take it to levels of up to “five nines” availability. With horizontal server scalability, you can increase your capacity with no compromise to performance and meet any increasing load requirements as your organization grows. Artifactory HA lets you perform most maintenance tasks with no system downtime. As the number of binaries used by your organization grows (whether built in-house or downloaded), and the number of development teams grows, managing those binaries across development, QA, production and possibly more environments needed by each team can become a maintenance nightmare. Creating the required separation by keeping different copies of the same file across different partitions of your file system might work, but this needs to be strictly controlled, requires intensive management, and can quickly become… unmanageable. Artifactory removes the need to create different copies of the same file. Only a single copy of any binary is ever stored on the file system, and Artifactory manages access to the file through repositories. Repositories behave like virtual file systems which you can dedicate to development groups and their respective environments. Access by the different teams (and the build server) is controlled by defining corresponding repositories and configuring access control on the binary as it goes through the development lifecycle. If you now consider the matrix of binaries, development groups and environments in your system you can understand the benefit of managing your binaries through repositories in a Binary Repository Manager such as Artifactory. No need to copy files or replicate environments to support the development cycle. A virtual repository encapsulates any number of local and remote repositories, and represents them as a unified repository accessed from a single URL. It gives you a way to manage which repositories are accessed by developers since you have the freedom to mix, match and modify the actual repositories included within it. You can also optimize artifact resolution by defining the underlying repository order so that Artifactory will first look through local repositories, then remote repository caches, and only then Artifactory will go through the network and request the artifact directly from the remote resource. For the developer it’s simple. Just request the package, and Artifactory will safely and optimally access it according to your organization’s policies. Every organization needs to implement security policies so that people can only access internal resources that they are authorized to use. But how do you control what people in your organization download from external resources? How do you control which external resources are accessed in the first place? And then, how do you control where people in the organization put different binaries they downloaded or are working on? As the number of binaries that you manage increases, controlling access to them through the development cycle becomes more and more challenging. Artifactory can provide security and access control at several levels. From restricting complete repositories down to restricting a single binary, and from a group of any size down to a single developer. Virtual repositories let you restrict developer access only to reliable 3rd party resources that have been approved. “Excludes” and “Includes” let you use naming patterns to define anything from a whole repository that should be excluded from your organization’s access, to including a single artifact within a repository which may be critical for your development efforts. Permission targets and permissions can be defined to configure user or group access privileges to different resources that have been downloaded. Integration with LDAP, SAML, Crowd and others manages access to your servers. Comprehensive log information lets you trace virtually any action done on any artifact managed by Artifactory. These comprehensive security and access control capabilities help you manage your development process by ensuring that developers can only access repositories for which they are authorized to. As Docker technology continues to evolve, its usage continues to grow. If you are not yet using Docker in your organization, it is likely you will do so soon. So now, in addition to all the other package types you are managing, you also need to manage Docker images. But there’s no need to onboard and maintain another tool. Artifactory is a fully-fledged Docker repository supporting all Docker Registry APIs. This allows the Docker client to work with Artifactory directly, presenting several benefits for enterprise Docker users. Whether you’re already on board with Docker or just evaluating how to introduce it to your organization, once you’re using Artifactory to manage your packages, you’re already covered for Docker images. Artifactory optimizes storage by ensuring that any binary is only stored once on the file system. When a binary is uploaded to a local repository, or downloaded to a remote repository, rather than storing the file in its original name under a specific path, Artifactory creates a checksum (both MD5 and SHA1 are supported) of the file and renames the file to its checksum. All the metadata about a file is then stored in the Artifactory database. Therefore, to create a copy of a file in a different location, there is no need to actually copy the file, only the metadata is copied and this maintains a reference to the same physical file. Using traditional file-system storage, replicating a repository means that if the same file is stored in several different places, it needs to be synched over to the remote site several times. As the number of binaries you need to manage grows to accommodate different stages in the build automation flow (Dev, QA, Production) and different customers (both internal and external), the amount of data you need to replicate to remote sites can multiply very quickly, and can consume huge amounts of network resources taking a considerable amount of time. Artifactory supports replication of your repositories to another instance of Artifactory which is outside of your local network. Replicated repositories are automatically synchronized with their source periodically, so that your artifacts can be made available to different teams wherever they may be located around the world. Artifactory’s checksum-based storage optimizes the replication process making it up to 10 times faster. Since any artifact is stored within a repository only once, and “copies” are actually metadata references to the same physical file, the amount of data that needs to be copied to the remote site when replicating a repository is dramatically reduced. The actual binary file only needs to be copied over once. Any additional “copies” represented by metadata, are much smaller than the file itself. As an added benefit, the metadata contains extensive log information regarding the physical file to which it refers. This means that any file within the replicated repository is copied over with full traceability. All relevant log information is stored in the metadata which is actually copied over. Part of your role as DevOps is to manage different infrastructure configurations depending on the environment – development, QA or production. Each environment may have different yet overlapping requirements for setup, and you need to be able to manage all the packages that should be installed easily and efficiently. Artifactory can make configuration a quick and painless process. You can define specific repositories per environment and direct your CHEF configuration script to the right repository in Artifactory. This ensures that each server you configure will only get the packages approved for the designated environment. And if there are overlapping requirements between the different environments, there is no need to maintain multiple copies of any package. Artifactory manages that for you with internal references. User Plugins give you a way to extend the functionality of Artifactory with any custom behavior required by your organization. To keep things simple, they are written as Groovy scripts and have a simple DSL to wrap them as closures within the extension points. The plugins can be changed and redeployed on-the-fly, and can even be debugged – all from within your favorite IDE. While organizations may share common best practices in how they manage their packages, each organization is different and may have some unique requirements. Artifactory generates an event for virtually every action performed on a package including download, deployment, moving, copying and more. For every such event you may write a user plugin that effectively extends the Artifactory REST API giving you a simple way to add functionality to Artifactory, and implement complex, custom behavior in your binary management workflow. This includes scheduling tasks, managing security and authentication, license compliance and opensource governance, artifact resolution and deployment, build integration and promotion logic, maintenance and cleanup and more. 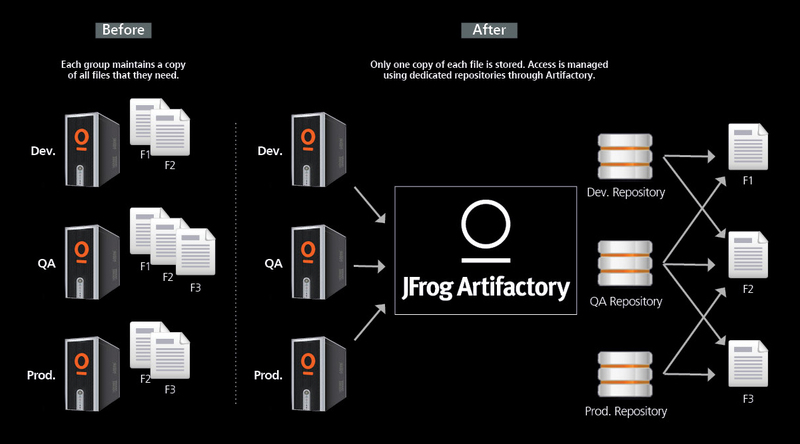 This white paper has shown how DevOps can use a Binary Repository Manager such as Artifactory to support the development cycle in a continuous integration environment. From quick and easy configuration of servers to secure and reliable access to repositories, Artifactory provides DevOps with a tool to efficiently manage binaries across the different environments of your organization.